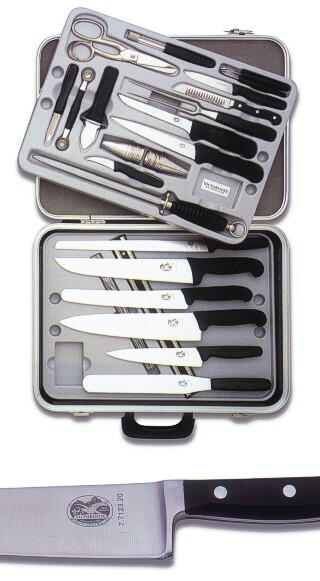 Large chefs case consists of butchers knife, pastry knife, flexible spatula, chefs knives, salmon knife, 3 tying and larding needles in transparent hull, potato peeler, potato baller, oyster knife, fish shears, apple corer, round sharpening steel, shaping knife, 10 icing funnels, 10 icing decorators, filleting knife, boning knife, straight chefs fork, decorating knife, kitchen and paring knife, lemon decorator and lemon zester. Main knives are drop forged and hollow ground with floating rivet handles - the best of the best. All other knives have polypropylene handles.